Home » Blog » Want to improve Customer Experience? These are the 3 Technologies that you should be aware of! Want to improve Customer Experience? These are the 3 Technologies that you should be aware of! Customer Experience successfully drives the business to the path of growth and profit. It is the critical competitive differentiation that sets a business apart from its competitors. 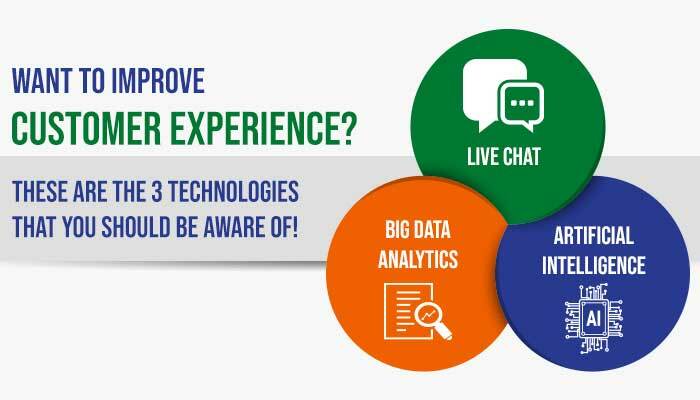 Here are the three technologies that are imperative for delivering the best customer experience. Said so, it is essential to understand that the technology is just the enabler and a good CX is the outcome of the consolidation of people, processes, and technology. Most importantly the company’s people are the face of CX. Today’s customers don’t like to wait. They want an immediate response and what can be a better way than Live Chat! Live Chat helps to cater customer needs efficiently. It gives an open-ended platform for offering instant support and timely assistance. Various studies have shown that implementing live chat services has significantly improved customer satisfaction. In one of Inc’s article, it was stated that 92% of customers feel satisfied when they use the live chat feature. Customers find live chat to be very convenient as they can connect with an agent instantly and get real-time and personalized support. Their issues get addressed swiftly. The other best thing they find about live chat is that they can multi-task while having a conversation with the live chat agent, which they consider to be an added advantage. It’s no secret that Artificial intelligence is flourishing and expanding its horizons every single day. With AI companies will be more efficiently and effectively be able to meet customer’s requirement and needs. For instance, data insights play a pivotal role in CX enhancement. However, customer experience data comes in the form of messy, unorganized datasets that need to be reformed into rational patterns to derive positive outcome. The tedium of pulling the data sets together and transforming them into no-complex consistent patterns is overwhelming. But for AI this is the prime stomping ground. It does it seamlessly and in a minor time frame. It’s high time that people start looking at AI with a different paradigm; it is not here to replace humans but to assist them. Combining AI and Human Intelligence can lead to seamless customer experience! Big data analytics is a game changer of the CX world. The application of this technology is transforming the way the businesses are interacting with their customers. Big Data Analytics comes handy while analyzing the data collected from customers, and providing tailor-made solutions as per the expectations and aspiration of the customer. As showcased in a Salesforce survey 57% of customers share their personal data with companies for receiving discounts and personalized offers. Big Data Analytics helps in analyzing this humongous amount of data obtained from customers into an actionable way. It thus, aid in providing personalized services and delivering a better customer experience. Integrating these technologies into your business will help you to meet today’s customers’ expectations and to stay at the top in the battlefield of customer experience. This blog was earlier published on LinkedIn.